Bristol Food Network Blackboard Challenge! 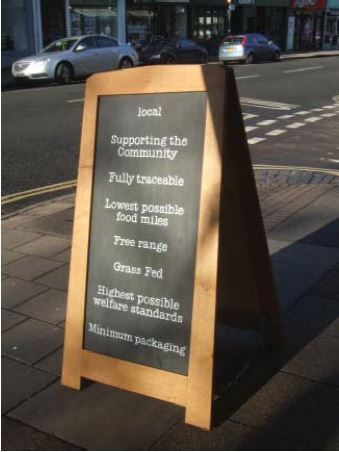 In Bristol’s Green Capital year 2015, Bristol Food Network issue a ‘Blackboard challenge’ to all Bristol’s food businesses – whether you run a shop, café, bar, pub, restaurant, take-away, school tuck shop or office canteen. If you’re proud of what you sell, or the ingredients that you use, then tell your customers about it. Tell us what you source which is local, seasonal, fresh, fairtrade or organic. A Blackboard is a great way to highlight what’s different about your food business. If you’ve thought about your sustainable sourcing, then shout about it. Because if you don’t pass that information on, then the only people who’ll know are you and your suppliers. Your customers will see that you care, and may start to ask questions of other businesses who aren’t quite so revealing about their stock or ingredients. We’ve gathered together some examples from a few businesses around Bristol here. We’d love to see some more!